Ugly Christmas Sweater Party Centerpieces. Are you hosting an ugly sweater party and need to know what to do for your centerpiece decorations? Here are some ugly Christmas sweater party centerpieces. Plus, lots of ideas about decorations for your table. At your ugly sweater party, you will more than likely have a table set up of games and prizes or even refreshments for your guests. 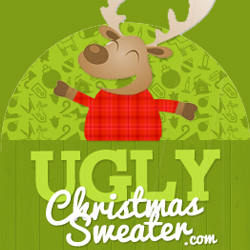 Here, we are going to help you decorate your table and theme your party around the “ugly sweater party” theme. There are do it yourself ideas like how to create your own ugly sweater ornaments. Plus products you can purchase to make your table look awesome for your ugly sweater holiday party. A step by step tutorial on how to make a small table top Christmas tree decoration. Watch this video to learn how to make a small table top Christmas tree that you can decorate with ugly sweater ornaments for your tables centerpiece decoration. Making your own small Christmas tree? Aint no one got time for that! Here are beautiful small Christmas trees that will sit and look nicely on your table. One of these small table top Christmas trees would make an excellent centerpiece for your table decorations. Add ugly sweater ornaments to bring your party theme together. Your table will look nice decorated like this. It’s pretty easy to make your own ugly sweater ornaments. This video gives clear and easy to follow step by step directions. The results are very nice too. Life is to fast paced and you are way too busy to make your own ugly sweater party decorations. We totally understand! There are plenty of nice ornaments already on the market. Use these ugly sweater ornaments to decorate your table top Christmas tree. Every table needs a table cloth. Here is an easy way to pull in that Christmas time feel to your holiday party. Add a reindeer themed table cloth to your table top to really pull off that ugly sweater Christmas party feel. For those of you who don’t have time to make your own tablecloth, there are plenty of them on the market already. Here are ugly Christmas sweater themed tablecloths in many holiday patterns. Match one of these table cloths up with your ugly Christmas sweater party centerpieces. Bring the ugly sweater theme into your party with these serving trays. Present refreshments to your guests and pull in the theme on your holiday party at the same time with any of these holiday themed serving trays. Candles are a great way to set the mode for your holiday party. Add these flameless candles around the table to tie in your ugly Christmas sweater party centerpieces. There are flameless candles in a lot of ugly sweater designs to pick from. Here are some of the best ones. Are you still looking for ugly Christmas sweater centerpieces? Here are some more of the flame less candles that you can place on your table. Or use one as decor for your home during your party. Candles make perfect Ugly Christmas Sweater Party Centerpieces!